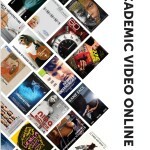 Click on this image to view a dazzling trailer for "Streaming" that the University Press of Kentucky has created. Eventually we’ll presumably all be wearing Google glasses or something more directly connected to – or imbedded in – our brains. Information will be as available as air. Netflix – it’ll be so last week! But “streaming” – not only of films and other media artifacts, but of information in numerous forms – is here to say, so it makes sense to ask what it is all about, where it is heading, and how it is changing the way film and television viewing is evolving. That’s a more sensible approach than denying or even decrying the streaming revolution, says Wheeler Winston Dixon. 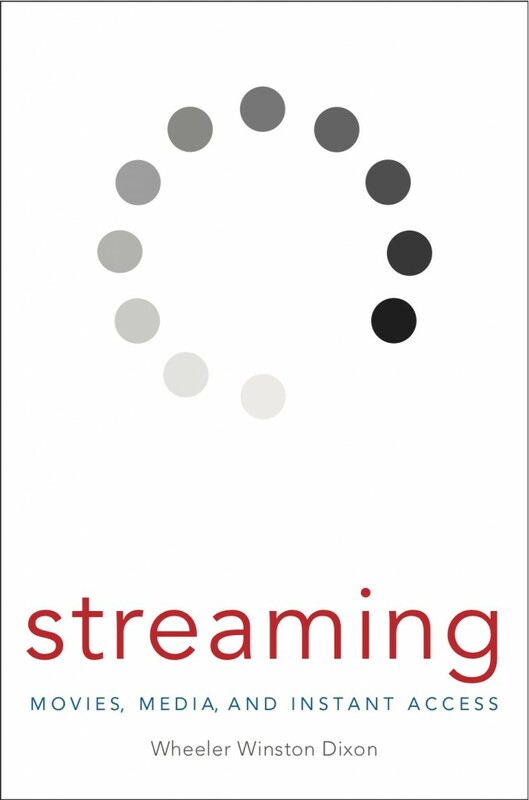 His new book, Streaming: Movies, Media, And Instant Access, just out from the University Press of Kentucky, not only describes how digital platforms – laptops, smartphones, television monitors – have come to serve as destinations for streaming digital feeds, but also asks what it all means for viewing, media consumption, and even various forms of social interaction. 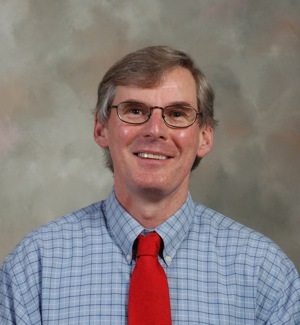 Dixon, a professor of film studies and English at the University of Nebraska, Lincoln, has a long history of compelling publications about film. His books include A History of Horror (2010), Visions of the Apocalypse: Spectacles of Destruction in American Cinema (2003, Disaster and Memory: Celebrity Culture and the Crisis of Hollywood Cinema (2009), Death of the Moguls: The End of Classical Hollywood (2012), and Film Talk: Directors at Work (2007). He is also coeditor in chief of the Quarterly Review of Film and Video. In Streaming, he writes about the end of the era of movies being confined to theaters, and more recently, to video stores. The new day is one of ready access to more movies than anyone could watch in several lifetimes – that, thanks to the Netflixes, Hulus, and Amazon Instants of the new media cloudscape. Dixon argues that there’s good and bad in the transition to digital formats and distribution models, but there also is no denying that the tide is not turning back, as he told MIAN in an email interview (10 July 2013). The ways we watch films and other moving image artifacts are quickly changing. How have your own viewing habits changed over the course of your career? I’ve watched film change and morph for more than half a century. As I grew up, everything was being shown in theaters in 35mm, and at colleges, universities and libraries in 16mm, and there was, of course, no such thing as home video, VHS or DVD. Films screened on television were really “streaming” – they were broadcast at a certain date and time, and you had to be present at that time to see them. I remember vividly setting my alarm clock for 1 a.m. or later to see films on WCBS TV’s The Late Show, and then The Late, Late Show, and even The Late, Late, Late Show, which is how I saw most of the classics growing up. I would also haunt revival theaters in New York City, such as the Thalia and The New Yorker, to see the classics projected in their proper format. Video, of course, has been around since the early 1950s, but I don’t think anyone, even professional archivists, ever thought it would completely replace film, but it has. 16mm is completely defunct as a production medium, except in the case of Super 16mm which is used sometimes in features (such as The Hurt Locker) to save costs, but then blown up to 35mm, or now, skipping that step entirely and moving straight to a DCP. Film is finished. It’s simply a fact. 35mm and 16mm projection are now a completely rarity, and screenings on actual film are becoming “events,” rather than the norm. This is simply a platform shift, and it comes with various problems, mainly archiving the digital image, which is much more unstable than film. But with the image quality of RED cameras for production, and digital projection taking over, it’s an inescapable fact that shooting on film is now the moving image equivalent of stone lithography. So now, my own viewing habits have moved to DVD and Blu-Ray, and I have a ridiculously large collection of DVDs in my home library, some 10,000 or more. I have to have them in this format, because I can’t count on the quality of streaming videos from Netflix, Amazon, or other online sources. Blu-Ray, in particular, yields a truly remarkable image. So that’s how I watch films now, and in any event, the revival houses, even in major cities, are all now pretty much a thing of the past. What are the implications for film studies of critics being able to watch so much, now? Were earlier studies necessarily incomplete and perhaps distorted because fewer films could be viewed? The implications are enormous. In the past, one had to rely on extremely expensive 16mm prints for accurate transcriptions of a film; now, a DVD or Blu-Ray serves much more effectively to bring a film back to life for further study and review. Yes, earlier film criticism was certainly hampered by the relative inaccessibility of a film – renting a 16mm print was a big deal, and then you needed a projector, screen, and the cost was considerable. Now, you just pop in a DVD, and there it is. Second hand accounts of films almost “became” the films, and with the ubiquity of home video, this is no longer the case. It’s invaluable for critics and historians, and although many, many, many films are not available in DVD or Blu-Ray (or even VHS!) format, the list of what is available is growing every day, and I would say that more is now available to both the casual viewer and the scholar than at any time in the past. Where will the rapid trans­formation of viewing possibilities lead, in general terms – in the film market, in viewership, in the forms of cinema and other moving-image forms? Streaming video now rules, to put it bluntly. Only mainstream spectacles still draw crowds to theaters. Most people seem content to view films on their laptops or computers, or televisions, and binge viewing of mini-series seems to be a new model for viewership, as witness Netflix’s House Of Cards miniseries, on which all 13 episodes were released on the same day, so that viewers could watch the entire show at one sitting, which many people apparently did. 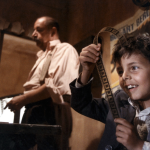 With big budget spectacles ruling the box office, and more thoughtful films being relegated to streaming video or DVDs, the entire experience of viewing a film has changed. It used to be that one went to a theater, and sat in a crowded room with relative strangers, and a sense of community was formed in the darkness, as the audience witnessed the film, in big screen format, unfold before them. This has now been replaced by the solitary experience of viewing a film alone, or with just a few friends, and so film societies, where one would screen a film, and then afterwards everyone would repair to a bar or coffee house and discuss the film, are a thing of the past. So, to recap: in the future, for the most part, only spectacles will sell. 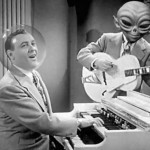 You have to lure audiences away from their computers to see a film in a theater, just as in the 1950s when television first appeared, and so spectacle, 3D, and blasting soundtracks will dominate the multiplex. These films cost a lot of money to make. They are a significant risk for the studios, costing upwards of $200 million or so in many cases. Studios will thus throw their ad dollars at these films, and relegate the rest of the smaller, more intellectually ambitious films to the margins. The days when an indie could dominate theaters – except in a few, very lucky cases – is over. 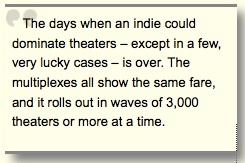 The multiplexes all show the same fare, and it rolls out in waves of 3,000 theaters or more at a time. The best, most interesting and challenging films I see are now on pay per view, because they never open in a theater at all, even in major cities. Are there aspects of the transition that have surprised you, even though you have long been steeped in movie watching and study? The advent of home viewing formats didn’t surprise me, nor did the nearly complete erasure of film as a production and presentation medium – I predicted this in a talk on NPR with Bennett Miller on May 4, 1999, and at a lecture in Stockholm on December 3, 2000. At the time, no one believed me. Objections were vociferous; how could film simply disappear? I pointed out that The Jazz Singer opened at one theater in New York in 1927, and within five years, the industry had scrapped silent films entirely. The cost benefits to the studios were overwhelmingly obvious; no more 35mm prints, no more costly shipping, no battered film prints to replace, and total control over projection through DCPs [Digital Cinema Packages], that need KDMs [Key Delivery Messages], to unlock them. So the digital revolution seemed like the next logical step in the evolution of the moving image; the new platform, just as safety film replaced silver nitrate stock, which in turn had replaced paper film at the turn of the 20th century. I realized – and welcomed – the fact that all the films now on 16mm and 35mm would be available on VHS, and later DVD and now Blu-Ray, but one thing I didn’t foresee was the complete erasure of experimental or avant-garde filmmaking from public view, in 16mm prints from distributors such as The Filmmakers Cooperative or Canyon Cinema, where many of the filmmakers have passed on, and their films have thus become orphan works. Somehow, I thought that 16mm and 35mm projection would continue to exist alongside digital projection for classic films, but this isn’t the case. If it isn’t on DVD, it just sits on a shelf, because there are no 16mm projector anymore, except in a very few museums and universities. 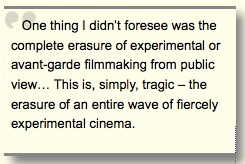 And this is, simply, tragic – the erasure of an entire wave of fiercely experimental cinema. 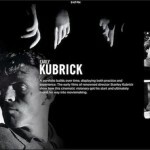 How will cinema-going change? Will easy availability through streaming to homes and portable digital devices result in cinemas being largely reserved for blockbusters that demand huge screens and blasting sound systems? Yes, for all the reasons I’ve listed above, smaller, more thoughtful films simply won’t have a chance in the commercial theatrical arena. Even filmmakers who break in with small scale, interesting first works, such as Bennett Miller, J.C. Chandor, and Gareth Edwards, to name just a few younger filmmakers, make one really superb small scale film and them succumb to big budget spectacle; they have to, simply in order to survive. That leaves the big screen arena to people like Cameron, Emmerich, Nolan, Abrams, and others, who are more than happy to provide mainstream thrills. The idea of watching a Dreyer or a Bresson film with an audience has simply passed it; no more community, just one or two viewers and a small screen, cut off from the rest of the world. Will cinemas perhaps become more and more theatrical, to appeal in ways that mere film-watching will not, at least not as often or broadly? 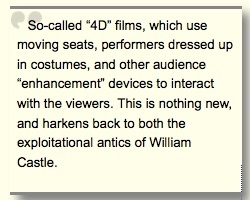 Certainly; this is already happening with so-called “4D” films, which use moving seats, performers dressed up in costumes, and other audience “enhancement” devices to interact with the viewers. This is nothing new, and harkens back to both the exploitational antics of William Castle (which I have nothing against, by the way – he knew he was making sheer escapist entertainment) and midnight spook shows in the 30s and 40s. Mixing film and theater will always be something lurking at the edges of the movie-going experience, but for me, the real test will come when 3-D holograms are perfected, and three-dimensional figures appear in space, without a screen, just as in a play, but with cinematic staging, backdrops, special effects and the like. That’s the next step down the line. Where do you stand on the whole issue of the quality of the experience of viewing analog versus digital images and projection? This may be heretical, and I was once convinced that I would never say this, but I now prefer a digital image rather than a filmic one, provided that the projection is top notch. There is a warmth and depth in the film image that is missing from digital cinema, but the upside – no scratches, cue marks, or damage to the physical print, plus the aforementioned economic advantages, both in production and distribution – is considerable. But all is this is subordinate to one central question that supersedes all other concerns: is the film worth watching? Does it add something to our lives? Is it a worthwhile piece of work, no matter how commercial, or is it simply junk filmmaking designed to take up space and time, offering nothing of substance to the viewer? More and more, what’s playing at the multiplex is simply a waste of time; it doesn’t matter whether it’s film or digital if it’s utterly meretricious in the final analysis. And all too often, this is the case. Film revenues went up after home-video tapes became common. Then, music corporations denounced MP3 and similar files as the death knell of their products and markets – that seems unlikely to occur, due to marketing innovations, and may even similarly result in booming listenership. So, what about services like Netflix, Hulu, and Amazon Instant? Do you see streaming resulting in a Doomsday scenario, or just an opportunity for corporations, large and small, to innovate, and settle into a new stable market? Well, the whole digital shift has done away with brick and mortar bookstores, record stores, and video rental stores, and may well do away with theaters unless they run mainstream fare, or have, in a large city, a dedicated and sufficiently large core audience. So the record companies were right, in a sense, and they woke up to the shift too late, as everyone knows; everything has shifted to downloads. CDs are all but obsolete, though still readily available, but vinyl, surprisingly enough, is making a comeback as a hipster phenomenon. But now that downloads, mp3s, and iPods are firmly established, and most people seem content to store their music in a cloud of one form or another, the industry has figured out how to make that pay, but it will never pay as well as conventional records did, either for artists or record labels. Mp3s are too easy to swap, copy, share and otherwise distribute; there is an enormous grey or black market in shared music and video files. This is why so called “360 deals” have become the norm, with artists spending most of their time on the road, constantly touring, to keep the money rolling in; live performances are the one thing they can really count on to generate revenue, along with all the merchandising of sweatshirts and the like that goes with it. Even Bob Dylan has to tour all the time, as do the Rolling Stones, simply to keep solvent. The other factor to consider is that there really are no more labels anymore; there’s just iTunes and Amazon; the average consumer doesn’t care if it’s on Columbia or Atlantic records. All they want is the content, and these dominant digital portals have set the price for the songs, usually at 99 cents a pop. There’s much less margin for profit than there was before, and the possibilities of piracy have rapidly expanded with digital downloads. Still, Netflix, Hulu, Amazon Instant and similar gateways are the new ruling forces in moving image distribution. My students, for example, when doing a research paper on a classic film, immediately want to know whether or not the film is on available as a streaming download. DVDs are seen as being simply too much trouble. And each of these providers is now developing their own programming, which is proving enormously popular. So there’s no Doomsday scenario here, in one sense, although a lot of people have suffered in the process – these new streaming distribution methods will rule the day. But the mom and pop bookstores, record stores, and video stores that dealt in the offbeat and unusual have all but disappeared. The real problem in the new consumer landscape is finding interesting content; once, everything seemed to have a level playing field, with all films being released in theaters, music on records, books as printed texts. Now, only the hypercommercial can really make any money, and the need for content is voracious – pop fiction authors, filmmakers and recording artists are being forced to up the quantity of their output to keep pace with the exploding demand for more, more, more. Might developments even prompt the emergence of smaller online, streaming distributors, like Mubi, just as specialty small-label CD producers sell their products – for modest incomes – online? Yes, this is already happening, with such small labels as Olive Films, which has released a great deal of interesting and marginalized work on DVD; as well as Alpha Video, which specializes in Public Domain material; VCI, which deals with low budget, cult British and American films; and Criterion’s Eclipse series, which distributes bare bones but superbly transferred versions of an array of fairly obscure but brilliant classics. Their Roberto Rossellini “Historical Films” set is a major find; but I really wish someone would release Alain Robbe-Grillet’s superb first film, L’immortelle (1962), which has never seen the light of day on DVD or VHS. And, of course, Roger Corman has recently set up his own YouTube channel, offering unlimited access to a library of his cult films for a mere $4 per month. Digitization is often viewed – naively – as a way to preserve films as well as to make new ones more efficiently. 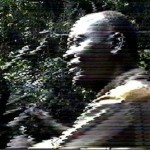 But what shortcomings are already emerging, in digitization both of completed films, and films as they are being made? When a film is digitized, far from being truly preserved, it requires constant maintenance and transfer to new platforms, in order to continue to exist, as demonstrated in a report entitled “The Digital Dilemma,” commissioned and executed by the science and technology council of the Academy of Motion Picture Arts and Sciences. Milton Shefter, a pioneering film archivist, and one of the authors of the report, notes that despite its pristine visual quality, the digital image is inherently unstable, constantly in a state of flux, and that storage of digital imagery is a never-ending process of maintenance and upgrading. So it’s clear that digital preservation is the issue facing us now; film is far more stable, and the major studios still strike 35mm fine grain masters and bury them in the vault even for films that are “born digital,” just as a backup. Often, it’s essential. Even a film as recent as Toy Story was found to have been damaged in digital format when it came time to release it to DVD, and only the existence of workprints and other materials allowed the film to be saved from oblivion. Digital production and distribution is convenient and relatively cheap, but storage – that’s the real problem, and the real question. To date, there is no digital storage method that can truly be relied upon to any real degree. You say that the new information grid is reshaping the media world – and film and other moving-image forms, within it – and that the outcomes are not really foreseeable. But what are your educated guesses about some of the ways things may go, in terms of viewing and also making moving-image products? It’s streaming – all the way. Barnes and Noble just reported massive losses for the last quarter, and the president of the company resigned; their Nook reader failed to compete with the Kindle from Amazon, and the stores now stock an increasingly limited selection of books. Newspapers are dying, and being spun off from media conglomerates to fend for themselves in a landscape that no longer values the permanency of print. So movies and television and web programming will all be shot digitally, and distributed through streaming video; this will only increase as the home TV, often not even in the home anymore, is integrated with the family computer. And, again, with the demand for more product, the new model for TV production, as pioneered by the series Anger Management, is the “10/90” deal, in which a series gets a 10 episode commitment, and then, if the ratings prove sufficient, it triggers an order for 90 more episodes to be shot as rapidly as possible – in the case of Anger Management 49 pages every two days, with no rehearsal, which means roughly an episode completed every working day – so that the series can go into syndication on TV or the web. This way, instead of taking years to pile up enough episodes to strip on a nightly basis, you can knock out 100 episodes in two years – even as I write this, Rosanne Barr is considering such a deal with NBC for a new sitcom. So the need will be for product, product, product, and more product, cranked out as fast as possible — quality really isn’t the main priority here, but quantity certainly is. How well does Congress understand the legislative challenges of the streaming world, and how well is it doing in addressing them? Congress can’t seem to get anything done right now, and I doubt that they understand any of this, or know how to deal with it, or know even whom to consult on this whole shift. But to be fair, this is really uncharted territory, and the entire landscape is changing at warp speed, so it’s hard to keep up. A few years ago MySpace was a burgeoning social meeting place; now it’s a graveyard. Who’s to say this won’t happen to Facebook? And with voice command search ability, how long will we be typing anything into keyboards – or writing books, rather than dictating them? It’s fair to say, though, that I think that Congress will be reactive rather than proactive in this whole situation – they’ll wait to see what happens, and then try to figure out what they want to do about it, if they can do anything at all. A lot of people seem to get caught up in their traditional ways and think that the “old days” are inherently better, but I for one am looking forward to the changes that are coming to the film industry. I think there will always be cinema’s around, even if they are just for art flicks or really pop culture oriented films (like that garbage Michael Bay tends to make!). Maybe one day something unexpected will happen like Netflix (or some other streaming service) deciding to open up a physical cinema, and charging people a monthly fee so they can catch the newest releases in this physical setting. This would be cool, and might help rejuvenate the industry which tends to piss people off simply by charging so much for a movie. I mean, back in the day it was $1 to see a flick. Now, I’m paying a small mortgage (or maybe not…) to watch a movie. Money is a big factor, and if streaming services are significantly cheaper, people are going to stick with those for sure. Way to go with the people though. Can’t wait!